Everybody experiences anxiety and that is something we can't avoid. In reality, anxiety is a normal part of life and truth to be told, we shouldn't avoid it 100% because believe me, anxiety can prove to be really useful. Scientists have found that a healthy level of anxiety results in improved results - musicians and actors are saying that stage anxiety helps them to give their best; athletes are using anxiety to mobilize their strengths. Some months ago I was in a situation with a lot of anxiety. 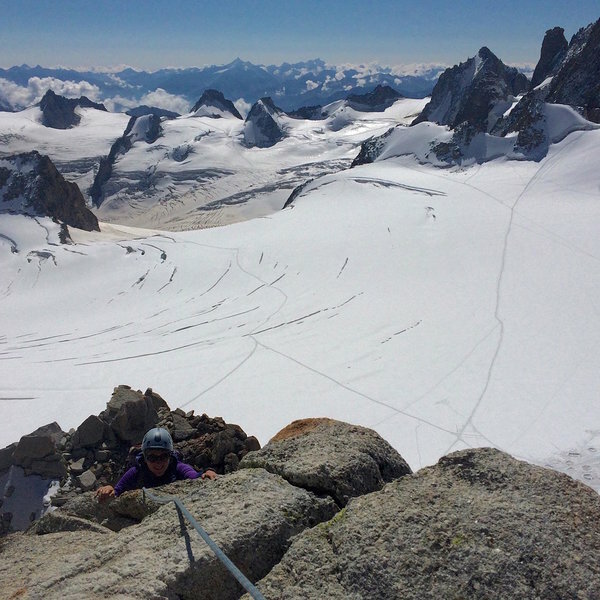 I was in the French Alps in Chamonix and the planned climbing trip that was supposed to last for two hours ended up being an epic seven hour feat where for the majority of time I was hanging on a smooth vertical rock with 300m of void below me. I remember looking up and seeing where we need to get. It seemed impossible, because there was so much of that vertical rock between me and the end goal. And going back wasn't an option either. So I decided to focus only to the next step that lie ahead - the next rock, nook or a cranny that would help me to make that next step. And I made it, step by step all the way to the top of the mountain. Of course I had friends with me that never stopped helping and encouraging me. Most of the time they believed much more in my abilities then I did myself. Despite my massive anxiety and low self-esteem, consistency and the support from my friends helped me to achieve something I never believed was possible. Trying to avoid anxiety in life no matter what it costs you are also missing out the chance to surpass yourself and achieve your dreams and goals. Excess anxiety can be paralyzing and there are people that suffer from the consequences daily. You don't have to climb a mountain or do something else crazy for that, anxiety can be "your loyal companion" in the simplest of social situations, in open or closed spaces or manifest itself in the form of constant worrying. It is very human and logical to try and get rid of it. The good news is that you can learn to control, direct and reduce excess anxiety. Avoiding situations that bring up anxiety - avoiding social contacts, elevators and every other closed and open space helps to reduce anxiety for a short period of time because when you avoid those situations and places, there will be no anxiety. But - that avoidance will generate long term problems, because you will never learn to function in those situations, you wont become socially proficient, your self-confidence will decrease even more and the certainty that these are fearful situations will deepen even more. Suppress the anxious thoughts - many people are trying to deny or even loose their thoughts that provoke anxiety. Those anxious thoughts are like table tennis balls that you are trying to submerge simultaneously - one, five or all of them will pop to the surface sooner or later. Anxious thoughts ain't going anywhere, because you try to get rid of them. Avoidance behaviours - excess drinking to look cool and confident, covering your face with thick layer of make-up to hide blushing or avoiding flying are just some of the examples of the behaviours that I've seen in my work with clients and what they are using to scale down their anxiety. Unfortunately those are strategies that are ineffective in the long run and will lower the person's quality of life instead. Alcohol addiction, weird look and missed family holidays are the consequences that are the long-term results of the mentioned behaviours. Noticing and questioning anxious thoughts - there is a myriad of different thoughts and they all have something in common when excess anxiety pops up - they don't reflect reality very well. For example a thought during a panic attack saying "I will have a heart attack right now and die" or seeing your colleagues talking to each other laughing and thinking "they all think that I'm a weirdo and they are laughing at me" are just thoughts, not facts. People have the tendency to see their thoughts as facts and believe that they are the absolute truth. Next time when those anxious thoughts pop up try to take a neutral position towards them and ask yourself - "what are the evidences that validate my thoughts", "what are the evidences that go against my thoughts?" Be a criminal investigator of your own thoughts! Accepting anxiety - like I said before, anxiety is a normal part of life and suppressing or erasing it from your life is almost impossible. Sometimes we even get more anxious because we are anxious: "what if I get anxious and loose my words", "perhaps I get dizzy because I can feel the panic already", "what if they see that my hands are shaking, because I'm nervous". Instead of those anxious thoughts tell yourself: "I am anxious, because that is normal in this situation. Even if the anxiety comes, then so be it and instead of the anxiety I will remind myself why I am in this situation and what I could do or say next and focus on that". Toughening up yourself - there is one really pivotal skill the students have to do underwater when they learn diving - they have to remove their mask and then replace it. Talking about this exercise alone creates great anxiety in many people, because you have to control your breathing and the defense reaction of your body to this threatening and un-natural situation is anxiety and sometimes even panic. All novice divers will practice that skill step-by-step, some say for starters that they are not able to do it, for some I even give a mask to take home so that they can practice in the kitchen sink before they are able to do it underwater. But practice makes perfect and I can proudly say that 100% of my students have mastered the skill many times by the end of the course. One thing I can always promise to my students is that when they have done the mask removal exercise five times in a row then at the end it will be an almost anxiety free situation. Nothing reduces anxiety better than facing the situations that bring up anxiety in the first place. How do you face your demons of anxiety?